Blizzard has now released its next big new game which takes characters from their vast universes and smashes them all together in a massive team-based rumble. It doesn’t stop there though, because they will be constantly updating the game with new features, game balances, and content like new battlegrounds and heroes. The best part about it is that it’s a load of fun and you can play it for free. We were invited back once again to chat with some of the creative developers at Blizzard, this time talking to Executive Producer Chris Sigaty and Technical Director Alan Dabiri. Luke Lawrie, Stevivor: The last time I spoke to you guys at Blizzard was back in January and you were just going into closed beta. 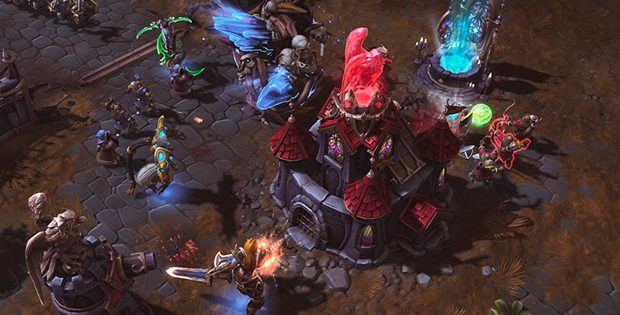 From the transition to that and into full release what was it that made you confident that Heroes of the Storm was ready to be put out there? Alan Dabiri: There were also some basic features that we just needed to make sure were in the game like progression systems, your profile, our ranking system and all these other modes. That’s kind of when you talk about when you feel you’re ready; this is the point where we are like, “Okay this is the platform, the base of this game.” But also the other key thing to say is that now that we are launching it doesn’t mean that we are done. Chris: Yeah, not at all. Alan: This is just the beginning. And now we keep on going, we keep on adding new stuff, new features and new content.